Let’s face it – you can get too much of black from time to time. A bright camera in a memorable color like pink is a great way to stand out from the crowd, and it can make for a fantastic present for a photography lover with a sense of style. Pink cameras aren’t just toys either. There are loads of fantastic models that come in this color, both digital and analogue, and whatever your photographic persuasion, we’re betting we can find a pink camera to suit you. We’ve rounded up a selection of our favorite pink cameras available to buy right now, and we reckon there’s something here for everyone. We’ve rated how each one performs as a camera, as well as how pink its pink coloring is (since that’s why you’re here, after all). So, without further ado, let’s get stuck in! At the affordable end of Fujifilm’s X-series stable, but no less impressive for it, the X-A5 is a comprehensively specced little mirrorless compact system camera that allows you to take full advantage of the fantastic range of interchangeable lenses available for X-mount (check our guide to the best Fujifilm lenses). Its large APS-C sensor boasts 24.2MP of resolution and produces the kind of beautiful color-rich images Fujifilm’s cameras have become known for. A full complement of connectivity options (Wi-Fi, Bluetooth and USB) make it a cinch to transfer your images off the camera for upload to social media, and there’s a high-resolution tiltable touchscreen on the rear for monitoring your shots. The sensor benefits from on-chip phase-detection for fast autofocus performance, and there’s even 4K video, albeit with a 15p frame rate cap. Affordable and capable, the Fujifilm X-A5 will do everything you need it to, with bags of style to boot. Spanning a range from wide-angle to moderate telephoto, the Sony Cyber-shot DSCW830 is a capable all-in-one camera that’s great for packing into a travel bag. It offers Sony’s well-regarded Intelligent Auto mode, which is capable of analysing a scene and picking out settings that are appropriate for it, and there’s even a 360-degree panorama function that’ll automatically do the stitching for you. Perfect for those mountaintop vistas! The Zeiss branding on the 8x zoom lens also means you can be sure of its optical quality, even if the maximum aperture of f/3.3-6.3 is a little underwhelming. Also, be aware that video resolution tops out at 720p, so you’ll want to go with a different model if video is something you’re keen on. The bulbous, bubble-like design of the Fujifilm Instax Mini 9 may have you thinking it’s a bit of a toy, but this camera does pretty much everything a budding instant film photographer would want it to, and it does it with one of the most affordable instant films on the market. A selfie mirror on the lens barrel makes it a great camera for self-portraits, and it’s powered by cheap and easily available AA batteries. 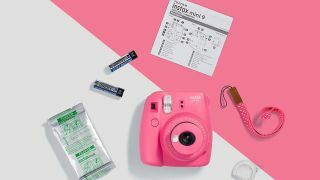 If you want creative control then you’d best look elsewhere, as this camera lacks many of the modes and options seen on its rivals, but if all you want to do is point, shoot and create beautiful mini Prints, this Instax camera will knock it out of the park. A lightweight compact camera with a refreshingly approachable design, the Canon Powershot Elph 110 HS is a great camera to simply pick up and start using. Its 5x optical zoom lens, covering an equivalent range of 28-120mm, benefits from intelligent optical Image Stabilisation which offers several different modes of operation for different shooting situations, and despite the relatively small size of the camera, Canon has still managed to squeeze on a 3-inch LCD screen for image monitoring. The Canon Elph 110 HS also has a facial recognition feature that can remember and store certain faces, along with an extensive Smart Auto mode that offers 58 scene types to choose from. All that also comes with Full HD 1080p video, meaning you’ll be covered for practically any shooting eventuality. NB. The Canon PowerShot Elph 110 HS is known as the Powershot IXUS 125 HS in the UK & Europe. Why choose between film and digital when you can have both? As you might expect from something with this particular branding, the Polaroid Snap spits out 2x3 prints on demand. However, it also saves images from its 10MP sensor directly to a microSD card, providing you with a digital copy of the image as well as the physical. The dual functionality is great for parties and fun photography, and more than makes up for a few handling quirks (the inability to manually toggle the flash is an irritating one). The prints come out looking sharp and smudge-free, while the camera offers six picture modes for different scenes, moods and styles. The great selling points of instant film cameras is there simplicity. Just point, shoot, and there you have it: a nice-looking print. The Kodak Printomatic certainly manages that; it may not offer great depth of features or manual control, but it’s simple to operate and will reliably produce good-looking prints in a range of different shooting situations. Indeed, it does this with such speed that it’ll allow you to shoot a second still while the first is still printing, ensuring you don’t miss the moment even if you were a little premature with the shutter button. It also has a switch that allows you to toggle between color and monochrome shots, and if you run out of prints, you can keep on shooting by switching to the microSD card. This ultra-slim compact benefits from many of Nikon’s latest connectivity developments. Photographers can use the SnapBridge app to instantly whisk low-resolution stills from camera to smartphone, allowing for quick and easy sharing on social media. The 8x zoom is also a handy tool, and can be extended to 16x with minimal loss of quality using Nikon’s Fine Digital Zoom. This makes up for a few areas where the camera is a little lacking: the f/3.7-6.6 maximum aperture, 1.1fps burst mode and 6-frame burst buffer, to name but a few. Still, if you want something that’s uncomplicated and fully connected, this compact will fit the bill. Yep. I mean, there’s a lot we could say about this one, but you probably already know at a glance whether it’s your thing or not. If you want to know, it shoots decent instant prints, as you’d expect from a camera with Fujifilm Instax branding, and has a useful close-up mode if you want to get up to 35cm from your subject. There’s a selfie mirror as well, and a viewfinder, and it’ll automatically adjust its brightness settings to adjust to the ambient light f the scene. Also, we think it’s kind of cool. There, we said it. Buy and be happy. Bet you never thought you’d see that prestigious Leica dot on a pink instant film camera. The Leica Sofort uses Fujifilm Instax film and technology, but pairs it with a 60mm f/12.7 lens that offers multiple focal modes and top-notch image quality. There are even bulb, double exposure and macro modes for the really challenging stuff, as well as a selfie mirror for the really not challenging stuff. The images come out simply fantastic, whether you use Fujifilm Instax film or Leica’s own, and the optical viewfinder is nice and large. If you don’t mind paying the premium, this is one of the best instant cameras around. High-quality 360° images in a single shot? Sounds great to us. Ricoh’s Theta cameras have garnered a deserved reputation for their ease of use and unique USP, and the Theta SC 360 does everything they’re reputed to do (see our guide to the best 360 cameras). It shoots Full HD video from its 360° perspective as well, and built-in Wi-Fi allows you to quickly transfer your creations to a phone or computer. This version is pleasingly small and light, and while its specification is unlikely to blow anyone away, it does what it does extremely well.